When it comes to entertaining, a man’s home must be inviting. One way to ensure that: the lighting. That’s why you should pay a visit to LitUp, a brand new den of lighting fixtures and handmade home goods, now open on an industrial corridor in North Center. This place is basically a general store of where’d-you-find-that housewares. The side project of an electrician and all-around creative handyman, LitUp peddles refurbished lighting fixtures built from vintage materials, making for one-off industrial pieces that speak to every man’s inner steampunk. 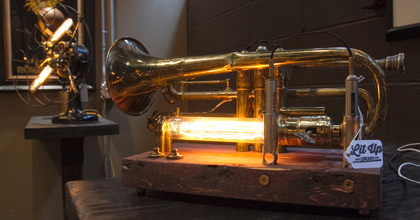 As in: Edison bulbs in vintage Westinghouse fans, or vintage jazz trumpets turned into desk lamps. In addition, LitUp offers what they call “functional trinkets,” like shelving made from vintage suitcases and other handsome conversation pieces. LitUp also entertains custom work. Each piece is original and built by hand. With their online shop still in the works, your best bet is to drop by the showroom to see all the goods in person. Consider it a bright idea.